I don’t think I slept for 6 MONTHS after watching this, and I wasn’t even that young! 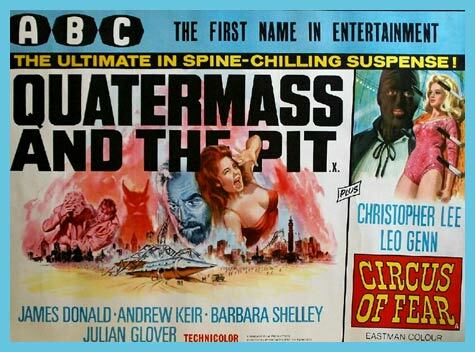 Oh, and finally, ‘Quatermass and the Pit‘ (AKA ‘Five Million Years to Earth‘) There is a scene set in a bombed-out house that still rates as one of the SPOOKIEST scenes I have EVER seen! Great Traumafession, QJS. Two classics that manage to have a creepy qualities. This is why I could never do a podcast! I would be trying to sound smart and saying “Quarter-mass” the whole time! But I must say, “Quartermass” is a good name for a hamburger. They should introduce the McDonald’s Quartermass. I feel better that I’m not alone. I just looked and my homemade VHS tape even says “Quartermass” on it. This has been going on for years! Lol. It’s so sad Good isn’t as accepting as Evil.